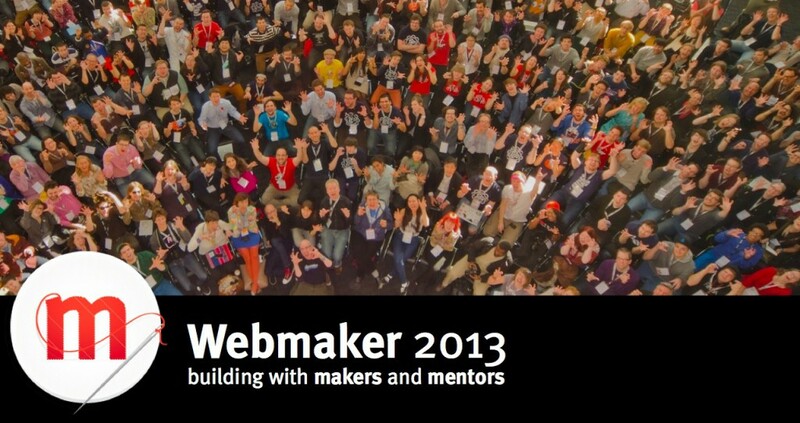 What’s the plan for Webmaker in 2013? Make it a product loved by makers and mentors. Working in the open with you. Mark Surman’s slide presentation (from the Dec 2012 Mozilla Foundation board meeting) explains. As a slidecast. You Tube video from the December 18 Webmaker call. As a text summary. Below. Webmaker teaches the art and craft of webmaking to anyone who wants to make something on the web. It starts with projects: users make (amazing) things, learning about the technology and culture of the web as they go. 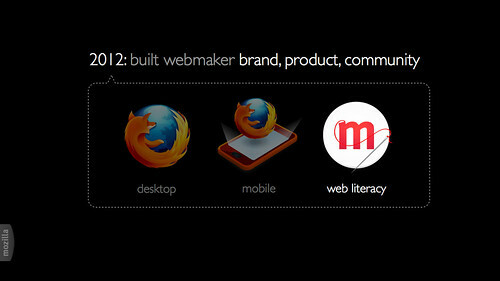 In 2012 we built the Webmaker brand, product and community. In 2013 we’ll refine, recruit and get more people using it. Big picture goal: Turn our basic Webmaker offering into a product people love. Refine it, recruit mentors and get more people using it. A product loved by who? Makers: creative self starters with something to say or show. What have we built so far? A year ago, we set out to move people from using the web to making the web. Our belief: people need skills and inspiration to build the web we want. What did we accomplish? 2) We built a core community. 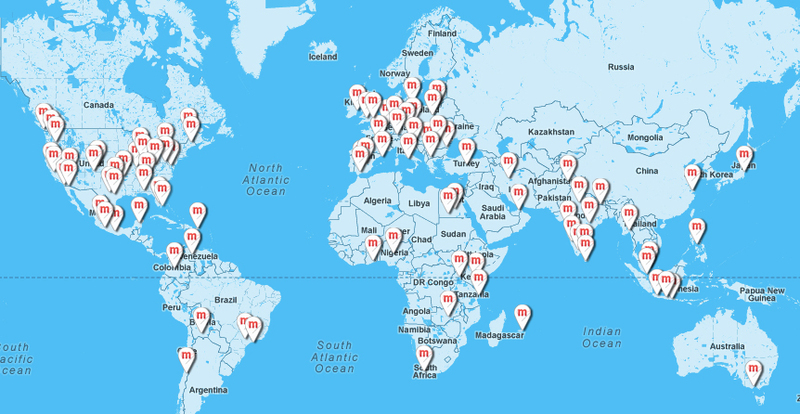 Approximately 1000 instructors and mentors around the world, showing people how to make things on the web. Our Hive NYC project is now also a model for emerging instructor networks in Toronto, London, Athens and SF. 3) We built Mozilla partnerships and leadership: Mozilla is now established as a key player in digital making and learning. Our Summer Code Party, Mozilla Festival, UK campaign, and efforts around SOPA/PIPA have brought partners and attention to our cause. Goal #1: make Webmaker a popular way to make, animate and remix content from across the web. Secret weapon: Popcorn as core feature, + Thimble and the X-Ray Goggles. Goal #2: build better ways to level up skills, craft and code as you make. 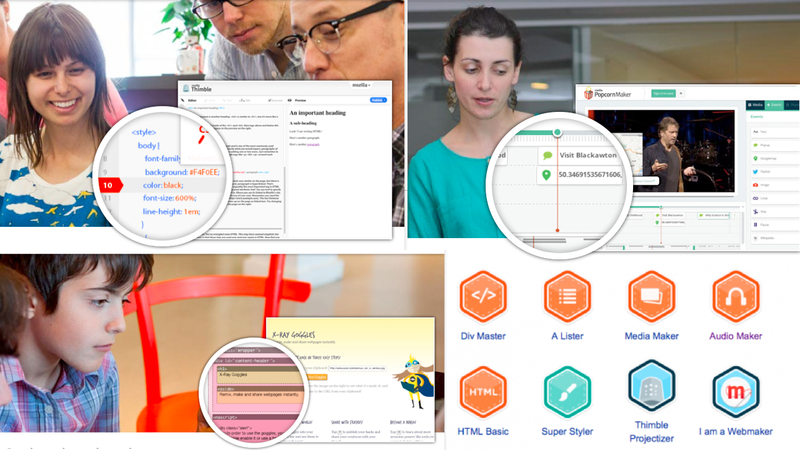 New feature: badges tied to social tools to encourage mentorship and critique. Core to our strategy: find, promote and build content to show off unique features of our tools. This moves beyond our current idea of projects. It starts with things people want to share, then bakes in learning. If we succeed in 2013: Webmaker will be a well-known tool for making a new kind of content. We will see traction amongst makers (250k) and mentors (10k). And we’ll have a better picture of where people learn and how we can disrupt. Ich habe Interesse mehr darüber zu erfahren leider ist mein Englisch schwach und mit Firefox kann man nicht mehr Übersetzen . Von daher wäre es gut wenn das ganzer in mehren sprachen aufgezogen wird. I am jazzed about the progress that has been made., You guys and gals are coming up with some unheard of things. Keep up the GREAT work and if I can be updated and learn from you, it will be fantastic! I know this is the only browser I use. Thanks for all you have done for me already.